von Eynatten, H.; Tolosana-Delgado, R.
Around 170 sediment samples from glacial and proximal glacio-fluvial deposits have been analysed for their geochemical composition. Samples derive from two strongly contrasting source areas (granitoids vs. amphibolite) and cover a broad grain-size range from coarse sand to clay. 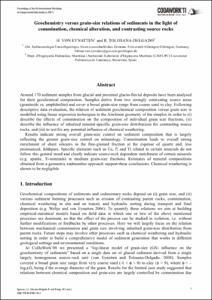 Following descriptive data evaluation, the relation of sediment geochemical composition versus grain size is modelled using linear regression techniques in the Aitchison geometry of the simplex in order to (i) describe the effects of comminution on the composition of individual grain size fractions, (ii) describe the influence of inherited mineral-specific grain-size distributions for contrasting source rocks, and (iii) to test for any potential influence of chemical weathering. Results indicate strong overall grain-size control on sediment composition that is largely reflecting the greater grain-size control on mineralogy. Comminution leads to overall strong enrichment of sheet silicates in the fine-grained fraction at the expense of quartz and, less pronounced, feldspars. Specific elements such as Ca, P, and Ti related to certain minerals do not follow this general trend and clearly indicate source-rock dependent enrichment of certain minerals (e.g. apatite, Ti-minerals) in medium grain-size fractions. Estimates of mineral compositions obtained from a geometric endmember approach support these conclusions. Chemical weathering is shown to be negligible. von Eynatten, H.; Tolosana-Delgado, R. Geochemistry versus grain-size relations of sediments in the light of comminution, chemical alteration, and contrasting source rocks. A: International Workshop on Compositional Data Analysis. "Proceedings of the 4th International Workshop on Compositional Data Analysis (2011)". Sant Feliu de Guíxols: Centre Internacional de Mètodes Numèrics en Enginyeria (CIMNE), 2011, p. P19: 1-12.